By the end of the Mexican War of Independence in 1821, there were about 4,000 Tejanos living in the province of Texas. The majority located in Nacogdoches, San Antonio de Béxar, and La Bahía del Espíritu Santo (Goliad). Almost half, about 1800, were living at San Antonio de Béxar. Many Anglo-American settlers, led by Stephen F. Austin, began to settle along the Brazos River in 1821 when Texas was controlled by The Republic of Mexico, recently independent from Spain. By 1830, the 30,000 Anglo settlers in Texas outnumbered the Tejanos six to one. The Texians and Tejanos alike rebelled against the centralized authority of Mexico City and the Antonio López de Santa Anna regime. Tensions between the dictatorial centralist government and the Texas settlers eventually led to the Texas Revolution. The revolution officially began with the Battle of Gonzales on October 2, 1835 and ended with the Battle of San Jacinto on April 21, 1836. General Sam Houston led the Texian Army to victory in 18 minutes over a portion of the Mexican Army under General Santa Anna who was captured shortly after the battle. 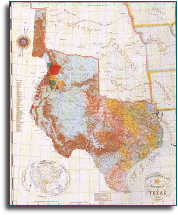 The conclusion of the war resulted in the creation of the Republic of Texas. Among the fifty-six men who signed the Texas Declaration of Independence on March 2, 1836, three were Hispanic: two Tejanos, José Antonio Navarro and José Francisco Ruiz, and the new Republic's first Vice President, Lorenzo de Zavala. The Republic of Texas was a sovereign nation from 1836 to 1845 which claimed borders that encompassed an area that included all of the present state of Texas, as well as parts of present-day New Mexico, Oklahoma, Kansas, Colorado, and Wyoming based upon the Treaties of Velasco between the newly created Texas Republic and Mexico. The origin of the name “Tejas” or “Texas” comes from the Spanish pronunciation of a Hasinai Indian word meaning "friends" or "allies." 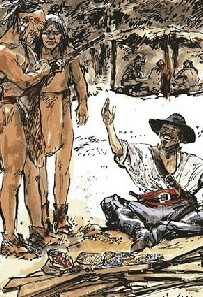 In the 17th century, the word Tejas was used by Spanish explorers and settlers to refer to the Caddo Indians of east Texas. The names Tejas and Hasinai were used interchangeably by early Spanish explorers who knew the westernmost Caddo Indians as "the great kingdom of Tejas"
Tejano history dates back to the very founding of the Province of Texas when the first Presidio Settlers and later, in 1731, the Isleños families from the Canary Islands came to settle in and around San Antonio de Béxar. Bexareño heritage comes from these Texans of Hispanic descent who were not only part of the founding of San Antonio de Béxar and the Villa of San Fernando, but who fought for Texas Independence in 1836. The term “Tejano” only began to come into use during the period just prior to the Texas Revolution between 1821 and 1836. José Antonio Menchaca, a third generation Bexareño and a Tejano army officer, who’s family received a grant from the Spanish Crown in 1762 was a true Texas patriot throughout his life. He fought in the battle of San Jacinto, served several terms as alderman, and participated in the defense of San Antonio when General Adrián Woll led a Mexican army into Texas in September 1842. During the Republic of Texas only four Tejanos (from the Bexar District) succeeded in gaining election to the Texas Congress: José Antonio Navarro, José Francisco Ruiz, Juan Seguín and Rafael de la Garza. Another Bexareño , Juan Martín de Veramendi the son of Fernando Veramendi, was elected vice governor of Coahuila and Texas in 1830, his daughter, Ursula María de Veramendi, married James Bowie. The only Tejano to be Bexar county judge before the late twentieth century was Erasmo Seguín. José Antonio Navarro and Ignacio Chávez were elected to county government as associate justices. For a list of the Alamo defenders go to “The Texians and Tejanos at the Alamo” located at the Alamo de Parras website. Blas Herrera and José Cassiano scouted the movement of Santa Anna on his march to San Antonio de Béxar. While seven Tejanos fought and died along side Anglo-Americans at the Battle of the Alamo, men from San Antonio rode on with Juan Seguín and Manuel Flores and figured prominently in the victory at the Battle of San Jacinto. Captain Juan Seguin commanded these brave native Tejanos as members of the Second Regiment of Texas Volunteers. One of the first Texans to reenter San Antonio after San Jacinto was Colonel Seguin. He took possession of the city on June 4, 1836. He had been named military commander and provisional mayor of San Antonio. As early as 1824, Miguel Ramos Arispe, author of the (Mexican) Constitution of 1824, referred to the citizens of Texas as Tejanos in correspondence with the town council of Bexar. Hispanics in Texas identified themselves simply as Tejanos as early as January 1833, when leaders at Goliad used the term.